It takes a lot of great people to organize an event such as iPRES. Behind the scenes, many volunteers are working on an inspirational iPRES 2019 program. As the conference will be held in The Netherlands, we have a Dutch Local Organizing Committee on the hunt for sponsors and making sure you get the best digipres experience in Amsterdam. Simultaneously, the international Program Committee has been meeting up for many months now to organize a tailor made program. So, who are these people in the iPRES 2019 Team? Pamela Vizner is a Consultant for AVP, an American firm specialized in data management and software development. Originally from Chile, Pamela is an active member of the international community and advocates for diverse participation and multi-lingual dissemination of information, which she hopes to bring to iPRES 2019 as a co-chair of the Papers & Panels team. Jesse de Vos works at the Netherlands Institute for Sound and Vision, the national media-archive of the Netherlands. With a background in mediastudies he now mainly focuses on the preservation of digital, interactive media such as games and websites. In the iPRES 2019 Programme Committee he is responsible for the Workshops and Tutorials. William Kilbride works for the Digital Preservation Coalition, an international not-for-profit membership organization. He started his career as an archaeologist in the early 1990s when the disciplines interest in creating new data sets and tools was not matched by the capacity to preserve them. He’s been working in digital preservation ever since. Barbara Sierman works as Digital Preservation Manager in the Research Department of the KB National Library of the Netherlands. Being an active partner of the Dutch Heritage Network and a great fan of the iPRES conference she took the challenge to become Organizing and Program Vice-Chair. Tim Walsh works as the Digital Preservation Librarian at Concordia University in Montreal, Canada. He is an archivist, librarian, and software developer who greatly enjoys the interdisciplinary nature of iPRES and counts himself among the growing community of “archivist/developers” working to contribute open ideas and open source code to the digital preservation community. Barbara Signori works for the Swiss National Library in Switzerland and is responsible for the digital collection. She was General Chair of iPRES 2016 in Bern; one of her best working experiences ever. Hardly surprising then that she is very happy to be back at iPRES 2019 as part of the Programme Committee. Natalie Harrower is the Director of the Digital Repository of Ireland, a CTS certified repository for the long-term preservation and dissemination of Ireland’s social and cultural data. Her research interests include digital cultural heritage and the research data lifecycle, particularly in the humanities and social sciences. Zhenxin Wu works for National Science Library of CAS in China. She is co-manager and the technical director of the National Digital Preservation Program of China, and will co-chair the papers & panels team. Marcel Ras works for the Dutch Digital Heritage Network, a collaborative effort of a group of Dutch heritage institutes, helping to address the challenge of reliable long-term access to digital resources. He was trained as an archaeologist and working in digital preservation since the late 1990s. Marcel is the manager of the DDHN’s Digital Preservation Program and Organizing & Program Chair for iPRES 2019. Andrea Goethals is the Manager of Digital Preservation at the National Library of New Zealand. As someone who relies on the iPRES conference for learning about new digital preservation initiatives, she was happy to help with the papers & panels. Angela Puggioni works for the Dutch Digital Heritage Network in The Netherlands. She has her own Communications & Copywriting agency since 2004 and – when told about iPRES 2019 – welcomed the chance to manage communication matters around this international event. Klaus Rechert is a researcher and emulation specialist, leading the digital preservation research group at the University of Freiburg and is since 2018 CEO of the OpenSLX GmbH. Klaus will co-chair the newly introduced iPRES 2019 hackathon sessions. Jessica Meyerson is Research Program Officer for Educopia Institute and coordinating member of the Software Preservation Network – a role that allows her to promote the essential role of software preservation in responsible and effective digital stewardship. Jessica was the panels chair for iPRES2018 and happy to be co-chair for this year’s communications team. Kat Thornton works on the EaaSI project at Yale University Library. Kat is happy to be supporting the Workshops and Tutorials track for iPres 2019. Remco van Veenendaal is preservation officer at the National Archives of the Netherlands, Dutch Digital Heritage Network project leader for persistent identifiers and member of the OPF-board. He feels bringing iPRES to the Netherlands is a great opportunity to learn from, connect and strengthen national and international digital preservation initiatives. Ingeborg Verheul is the coordinator of the National Coordination Point Research Data Management, an initiative in the Netherlands to further cooperation between research institutions on the management of research data. There is a close link with digital preservation activities in the cultural heritage sector. iPres 2019 is an excellent opportunity to bring experts from both worlds together. Annet Dekker is Assistant Professor Media Studies: Archival and Information Studies and Visiting Professor at the London South Bank University. She has extensive knowledge and expertise in the conservation of digital art, and works with great pleasure on preparing a hackathon for iPRES 2019. Annet is a member of the Program Committee as well as the Local Organizing Team. Erwin Verbruggen is a project lead at the Netherlands Institute for Sound and Vision, where he worked on digital preservation-related projects such as Presto4U, PREFORMA and the Winter School for Audiovisual Archiving. He was papers co-chair for iPRES2018 and is glad to be involved as a local organizer in this – his hometown – iPRES edition. Pepijn Lucker is a digital preservation adviser at the National Archives of The Netherlands, where amongst other things he works on the transfer of digital born government archives and databse archiving. Last year he attended his first edition of iPRES and presented the work of The National Archives on Preservation Watch. This year he’s a member of the Local Organizing Committee and will contribute to the peer review of papers. Walter Swagemakers works for Eye Filmmuseum (Amsterdam) as senior project leader collections. Managing projects in the field of digitisation, digital sustainability and the online availability of collections is a key component of his activities at present. He gladly contributes to the iPRES 2019 LOC-team. This post was written for the iPRES January Newsletter. Would you like to subscribe? 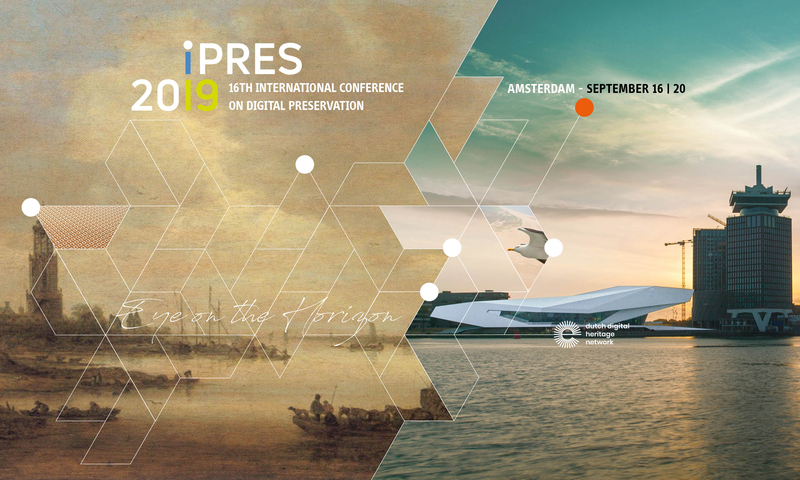 Just send us an e-mail: communications@ipres2019.org, and we’ll keep you updated on everything to do with iPRES 2019.
iPRES 2019 is hosted by the partners working together in the Dutch Digital Heritage Network.